Greek pottery began to be studies in the 18th century. It was known earlier and could be kept in cabinets with other 'curiosities', but it did not attract the type of attention enjoyed by classical sculpture, gems and coins until large numbers were found in Italy from the mid-18th century. An antiquary's shop in Naples. Gouache 1798. Anon. 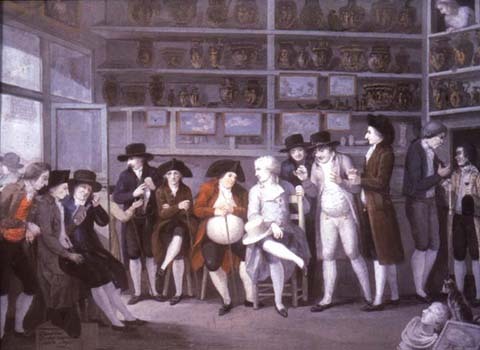 The picture above brings to life an antiquary's shop in Naples at the end of the century, with distinguished gentlemen amidst rows of newly excavated sculpture and pottery. Sir William Hamilton, English Envoy Extraordinary to the Court of the King of the Two Sicilies from 1764 until 1799, has been identified as the tall thin man, third from the right. Early 18th century Italian collections, particularly in Naples and its environs, were seen by Grand Tourists from northern Europe, who acquired their own vases and sometimes displayed them in special rooms decorated in an antique style. In this portrait by Pompeo Batoni, painted in 1767, a Prussian prince, Karl Wilhelm Ferdinand, stands beside Greek and Greek-style vases, not sculpture, as in earlier portraits of Grand Tourists. 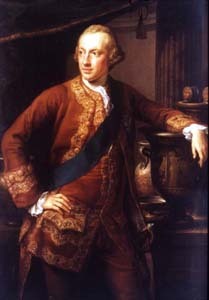 Married to a sister of George III of England, he was guided around Naples by Hamilton, and around Rome by Winckelmann, whose friend, the painter Mengs, supplied the vases in the portrait from his own collection.